Blizter: “So these two brothers had a lot of weapons. They were well armed? Yeah. A Ruger P95. That’s it for guns. 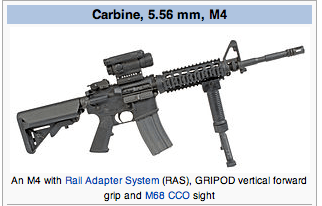 And, again, for those that want to skip ahead – yes, the media at one point said Jahar had the Carbine rifle with him on the boat, too. Mmhmm. We’re getting there. Not today, of course. But we’re getting there. “Before he died in a hail of bullets, the eldest Boston bombing suspect called his mother. ‘Mama, I love you,’ were his last words before the phone line went dead, his mother, Zubeidat Tsarnaev, told ABC News. However, news sources such as International Business Times‘ headlines read, “‘Tamerlan Tsarnaev Called Mom, Zubeidat Tsarnaeva, Before Deadly Shootout,’ Report says.” Before. Not during. My problem with this whole phone call? It seems that all links lead back to ABC. Why? Because ABC News reported that they obtained this information via a phone interview with Tamerlan’s mother, Zubeidat. I’m not saying Tamerlan’s mother never said it, nor that ABC’s phone interview never happened. I just want to hear the interview for myself but it seems to be non-existent. I haven’t spent months looking for it, but I’ve spent enough time combing the web that I should have found it by now. Nope. No dice. Gotta be honest, I have no idea where this CR-V comes into play. No.idea. 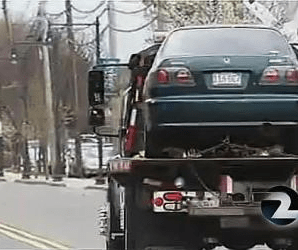 How is it that the state police had no idea that it was a Honda Civic these guys were driving (before and after they carjacked the Mercedes)? Did they just have the model of the Honda wrong? Oh, no. Because the CR-V is not that car with some misconstrued information attached. The license plate for Tamerlan and Jahar’s car was 116-GC7, not 316-ES9. And it was green, not gray. And a Civic. So clearly the CR-V is a completely different vehicle they’re talking about. What? Or perhaps Tamerlan was wondering if he should let the police know where he hid that state police SUV he stole and the black pickup he had been driving previously. Uh huh. We’ll get to that later. Then there’s the second recording (You know, the one where Jess Ica has now officially licensed the video. Is she trying to make money off of this? Seriously? Ugh. I’ll just link it.) This video has some serious gun fire in it. ➝ HERE. So how bad of a shot is each and every one of these officers that Tamerlan got within 5 to 10 feet of them without being shot dead? Was he the “man of steel?” Able to take a 100 rounds of bullets in a single bound? I don’t know. But I do know that law enforcement came out and said that Tamerlan (after getting this close) ran out of ammo (but the police never did), threw his gun at one of the officers, was tackled and then struggled against being handcuffed. Mmhmm. That’s because he was the “man of steel.” Obviously. Because it’s the only thing that makes this story plausible. Let’s just knock this out of the ball park with the death certificate. There’s the hospital’s inability to fill in an approximate time of death on the certificate. How could they not know when his death was if he was brought in alive? And how about the cause of death section? There’s a box marked “APPX INTERVAL.” My understanding is that this is the time between when the “issue” arose (like the gunshot wounds) and the time of death. It’s marked “MINUTES.” I believe this means Tamerlan died within minutes of receiving his wounds. But I’m not a coroner. Don’t quote me. “When asked about reports that Tsarnaev was run over by his fleeing brother Dzhokhar Tsarnaev, Wolfe said he did not see any obvious injuries that would back up that theory. Aw, come on. Someone pick a story and stick with it. Would the authorities have apologized for unloading hundreds of rounds on a residential street had one of those children been killed? Hmm. Read the article while you still can for free ➝ HERE. Scroll to the bottom and watch the last video. That’s the “Linda” I blogged about previously that called into a news station saying Tamerlan was hit by a police SUV and then shot multiple times. And I agree with “Linda.” Tamerlan was dead at the scene. So what about the suspects of the night? We have a minimum of three we can identify between the times of 12:45 a.m. on Friday, April 19 to approx. 1:30 a.m. early Saturday morning. Kind of a given here. *To clarify, Upland turns into Dexter as soon as you cross south over Mt. Auburn. So when you hear police on the radio say Dexter and Mt. Auburn, I believe they mean Upland/Dexter. Almost the same difference. How do I know this guy was at Upland and Mt. Auburn? The following picture from a news video (at approx. the 10:13 mark) and google maps kinda prove it, right? Right. Don’t let the media sway you at home, kids. I’ve watched a few newscasts from that night where the newscasters state that this suspect is in the same exact spot as the naked guy. Absolutely not true. Give me a minute. We’ll get there. So what did this guy do to attract all this attention? No idea. But I do know that reporters were saying that they pulled up smack dab in the middle of the scene at Mt. Auburn and it was like they were in a war zone. Gun shots, explosions, etc. Sounds like Dexter and Laurel, doesn’t it? But it’s not. So who was doing the shooting and letting off explosions? Was it the police randomly shooting their guns at people? One reporter said that he had never been so scared in his entire career. In THIS video that I just posted previously where you can see this suspect on the ground, well, you should watch the whole thing. It has these two reporters on it who spoke about their experience at Mt. Auburn and Upland. As the reporters were talking and being interviewed, they were slowly being pushed back by the police. Pushed back away from the scene where the guy in brown pants and a blue shirt was being held at gunpoint. At one point, as the reporters were talking, the one notices the ambulance (that had been parked by the guy in brown pants and a blue shirt) leaving the scene. The reporter starts walking over there to see if he can get a shot of anyone in the ambulance. You should really watch this video from the beginning because at this point, you’re watching with bated breath to see if this guy who was held at gunpoint is in the back of the ambulance….check out the 12:10 mark. And yes, that just happened. 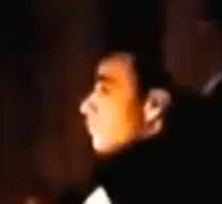 In this shot of the naked guy in the middle and Tamerlan to the left, you can see the noses are quite different. The top of Tamerlan’s eyes meet the bridge of his nose. Not really the case for naked guy. And the eyebrows are quite different, amongst other things. I’m not saying there aren’t similarities. And I’m not saying there isn’t a possibility of other suspects from that night that Tamerlan may look like. However, these two men are not the same man. Nor is the man on the far right the same as the previous two. Look at his hair. Need I say anything else? “No street signs here, just […], across from Dexter Spa. Across Dexter spa. The naked guy was put up against the wall of a business that was located directly across the street from the Dexter Spa, at the north-east corner of the intersection. So what time did this all happen? 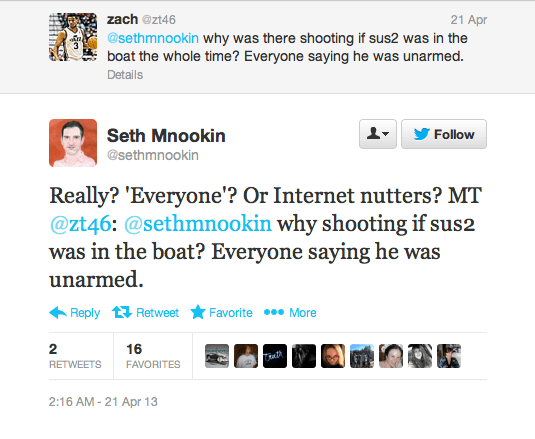 Journalist Seth Mnookin was there for the naked man situation and he began to tweet about it at 1:15 a.m. with “Lots of shouting. 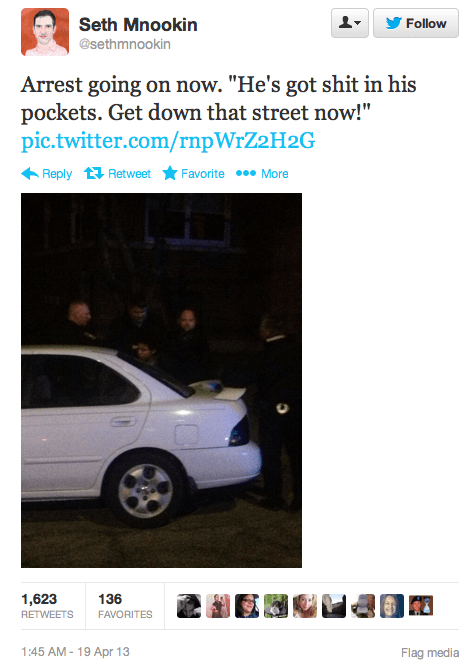 Police are trying to remove suspect from car.” He also tweeted at 1:24 a.m. “Police just loaded naked man into car.” Garret Quinn sent out a tweet at 2:45 a.m. showing a pic of the naked guy getting his photo taken in front of a building (not naked). That’s an hour and 15 minute difference. Is that how long it took the Feds to get there after the naked guy had been originally detained? Unfortunately for naked guy, I think that’s correct. CNN’s transcript where Gabe Ramirez says that “10 to 15 minutes ago” the Feds just showed up for naked guy was aired at 3:00 a.m. That would put the naked guy up against the business wall at approx. 2:45 a.m.
Mmhmm. He’s talking about the guy in the brown pants and blue shirt. I’d tell you what the response was to that but the police jumbled it on the radio. Smh. Ok, sorry. I digress. Going back to the radio in regards to this debacle on Nichols with the naked guy, we hear at approx. 1:38 a.m., “We do not have a second suspect in custody.” Yet, there’s the brown pants guy and there’s the naked guy. But no one’s in custody besides Tamerlan who was just pronounced dead 3 minutes prior? Is “suspect” the key word here? 10:24 “Update, myself and 536 have been redeployed to Dexter and Nichols for that second vehicle. Second vehicle? Second vehicle on Nichols? Or second suspect car for the night? Bottom line, they’re headed back to Nichols in the same area of Quimby and Nichols. 2. I do have some reservations about the naked guy and the photos of a man being taken into custody at Quimby and Nichols. 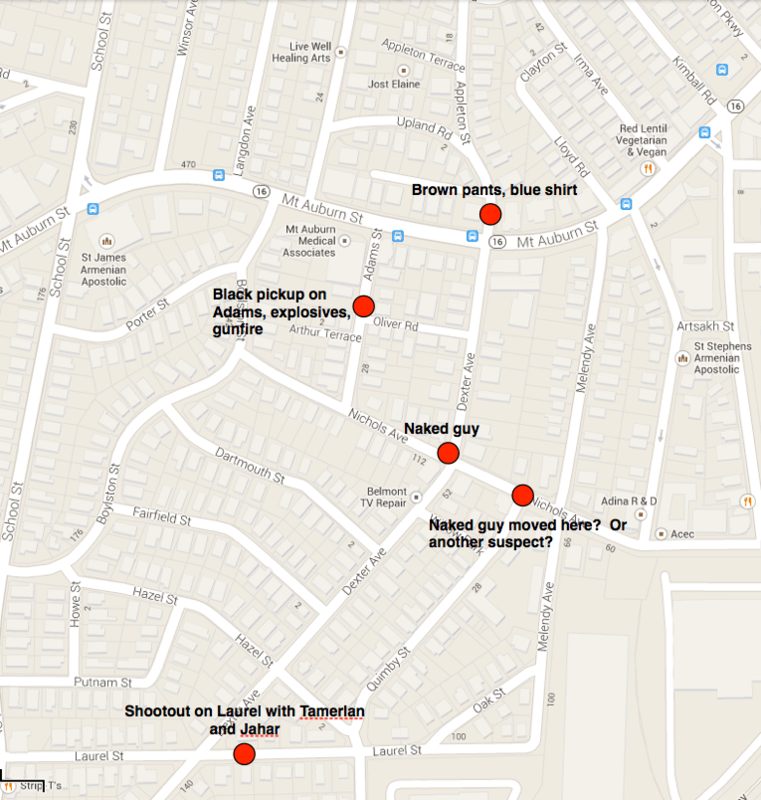 As I have it written now, naked guy’s car was on Nichols, west of Dexter. 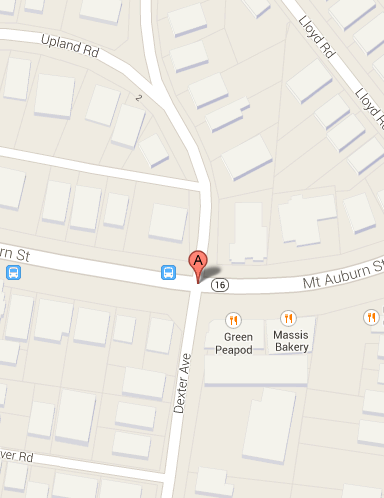 Then the police walked him east to a squad car near or at the intersection of Dexter. Next, they walked him a smidge more to the east to nearby businesses on the corner of Nichols and Dexter. They took his picture there. Then they walked him further east down Nichols to Quimby. The problem? Gabe Ramirez stated that after the FBI took photos of him, they took him back to the squad car – which would have meant they then walked back west to the car. Not east over to Quimby. 50:26 ADAMS STREET!! ADAMS STREET!! ADAMS STREET, WATERTOWN!! 50:38 SHOTS FIRED, ADAMS STREET WATERTOWN!!!!!! BLACK PICKUP!! 52:52 Shots being fired, stolen SUV from the state police. 53:04 That vehicle went down Adams St. from Mt. Auburn. Down Adams from Mt. Auburn. Mt. Auburn, Adams Street, a black pickup and a stolen SUV. Hmm. Let’s start with the black pickup…..yup, that’s pretty much all I got. I have no idea what this pertains to on Adams Street. And I’ve never heard anything since. Perhaps the black pickup truck was what naked guy was driving. He was driving down Mt. Auburn (While shooting and throwing explosives at officers. Obviously. And if not the black pickup nor the naked guy, then who was throwing these bombs and shooting up the place?? The shootout was already in progress on Laurel at this point. 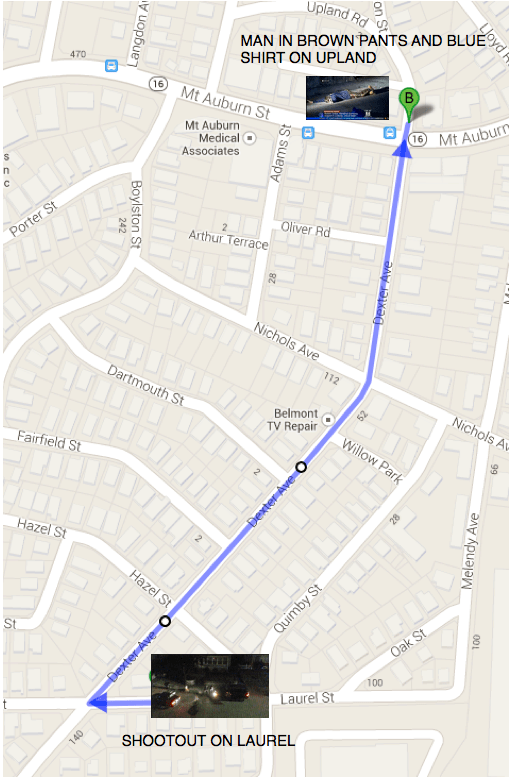 ), turned down Adams street and then made a left on Nichols as his final destination. Who knows. And the stolen SUV? Apparently someone from the Department of this reported a state police SUV stolen by none other than the Boston bombers. 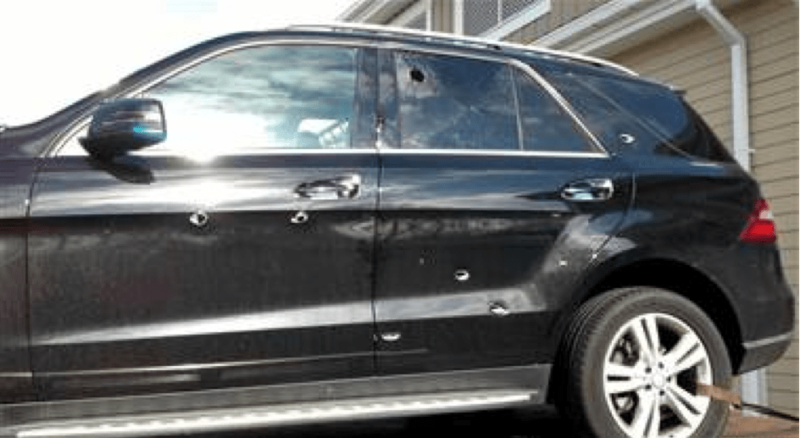 In fact, one unmarked black state police SUV was actually shot at by another police officer because of this report. Yup. It appears the cops can’t stop themselves from aimlessly shooting at moving targets – regardless of whether or not they’re a suspect, or, better yet, a fellow officer. Google it. It’s out there. UPDATE: Well look at that, I’ve got a map now for all of these shenanigans. Add in the podstava video that was taken at approx 524 laurel , maybe brown pants took it? I mean mount auburn st, not laurel. Nice! I’ve never seen this video. Thanks!! Very well written and quite informative! Watertown is the biggest question mark for me, and it seemed the most damning for the brothers, but your article is really showing another side to the story! Thanks! Yeah, Watertown’s a big bowl of hot mess. In a NY Post article about how the Watertown Police stopped Boston Marathon Bombers from attacking NYC, a Sgt. MacLellan “tried but could not unlock the rifle between the seats. 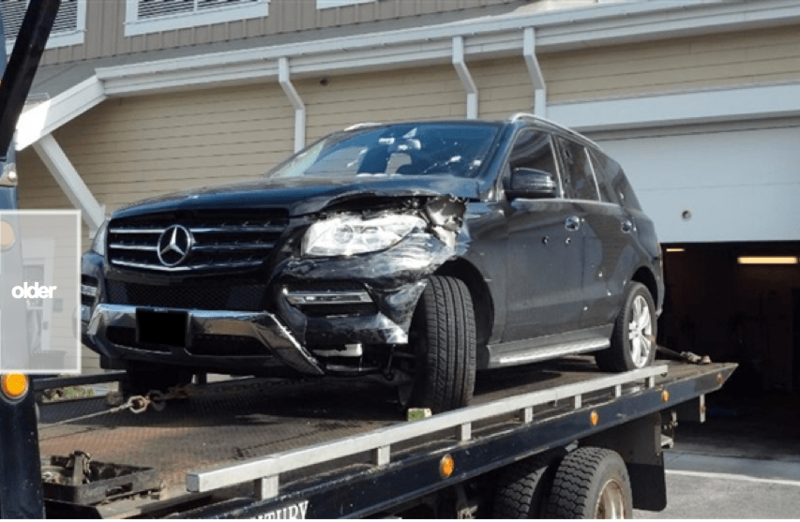 So he put his cruiser in drive, jumped out, and sent his empty vehicle rolling down the road toward the Tsarnaev brothers.” Maybe that was how Tamerlan got run over since he “turned out to have been shot 9 times” by then. Maybe. That would mean, however, that Kitzenberg was lying about the tweet pics he posted. See link HERE and scroll to 6th, 7th and 8th picture down. Yes. There;s the Watertown Police SUV crashed in Kitzenberg’s driveway with shot out windows. That’s probably the one that Sgt. MacLellan let go. No picture of Tamerlan getting run over by the Mercedes, in this series of pictures, though. Well damn, how’d you find this? Kitzenberg was not honest in his live interview with Jake Trapper. 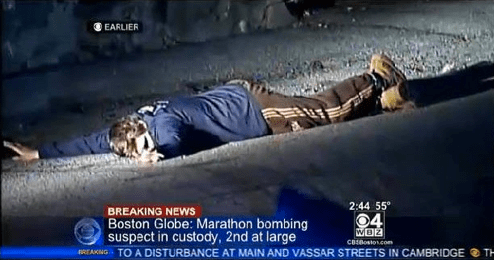 He offered information-such as saying “both brothers” were shooting, and it was only a day later we would begin to hear in updated information, there was only one pistol between the two brothers for their use-plus pictures do not show Dzhokhar with any gun or shooting at anyone. Kitzenberg admittedly did not look at what happened on the road below his windows, only filmed the scenes with his iphone. Therefore, he makes a piss poor “eye witness.” He hid below the frame of his window, shoving his iphone up higher to get the pictures. He himself said this in the live interview. He did not look outside much at all. Further, part of his time was spent running up his stairs to get to his bedroom, as he felt to close and feared getting shot by a stray bullet. The time he spent running and hiding he certainly wasn’t looking out any windows either. He took pictures —26 in all- one showing a person which might have been Tamerlan within feet of a uniformed police officer. The man wore a coat- and was not handcuffed. I remember seeing this picture. The indication I took while watching the live interview and seeing this picture was that it was of Tamerlan. 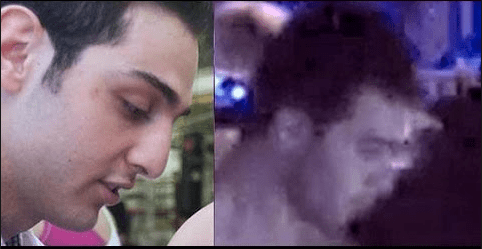 Kitzenberg should be forced to present all the pictures he has for use by the defense team in the upcoming trial–one picture may be proof– Tamerlan was within feet of a officer and alive and looking well at one time. I watched a”Youtube” and read comments of Tamerlan’s “arrest”. A commentator said he watched live local Boston T.V. showing the Boston Police beating the life out of Tamerlan–said it was an especially bad beating. The worst he had ever witnessed. His comments were to complain about telling video such as this being made and is available, but due to political correctness , or media cover ups–later the same news issue is discussed on television, probably the slanted version—but the horrible beating is absent. It’s no longer what the media wants the public to know of. The authorities have made so many stupid deliberate mistakes, they don’t deserve to be able to say “Oh, sorry–my bad” about any of this. Tamerlan should be here with all of us now–able to say what happened. Able to name FBI people who have offered him money, and exactly what they wanted him to do. Be so much easier to put the pieces in order then wouldn’t it? The homeland Security teams used these two brothers to create hysteria about Radical Extremism in this country and took Tamerlan’s life like he was worth nothing. Pure evil. A video on C-span — the original– parts one and two condensed into a program numbered 312587-1 shows Kurt Schwartz, the undersecretary of Homeland Security smirking in his comments when he spoke of how without the brothers doing what they did, the Homeland teams would have been provided no occasion to act out their training. In fact, he frequently refers to the entire event as a EVENT–not a tragedy during his statements and testimony to the house committee hearings about the Boston Bombings on May 9, 2013 on C-span. He seems to regard the entire tragedy as something that planned–as by his own statements he arrived on the scene ready to take charge–only minutes after the blast. His smirking and bad attitude makes me want to shine a light on the him and his FBI cronies–alll of them for what they really are. The brothers were set up, and they definately didn’t plan to allow Dzhokhar to live. The deal is finding out what the big secret i, I guess. I could see from watching this testimony–it definately meant to aid in the continuation of funding for Homeland Security and Kurt Schwartz wasn’t shy to put in his bid for “streams ” of funding rather than grants in the future. I’m not sure what exactly you’re saying here. Any witness could potentially be conceived as a “piss poor” witness. There are lots of studies done on witness recollection and memory and their accuracy. And every media outlet in the world reported the brothers had multiple guns. I’m not sure making Kitzenberg out to be the only bad guy is fair. As to the actual pictures he took – again, I am unclear of your point. The police have already admitted that Tamerlan was standing within feet of them and was alive and well. They’ve also admitted that gunfire ensued (and obviously that’s when he was shot). I don’t recall the police ever denying they shot him. I think it’s pretty obvious what happened: Tamerlan was absolutely shot (and I believe, killed) by the police – but I’m not sure where Kitezenberg and his photos comes into play in regards to that.